September is National Baby Safety Month and whether you’re a first timer prepping for baby or a seasoned parent just looking for a little review, here are some steps you can take to make sure your baby is safe and sound. Select the appropriate car seat for your child’s age and weight. Read the instruction manual thoroughly so you know how to appropriately install and buckle the seat. If you’re not quite sure what seat your tot should be using, you can look HERE. Plants can be a beautiful addition to your home, but they can also be toxic, making them dangerous for your children. Before selecting any plants for your home or garden, make sure to do your research and know both the common and scientific name of all the plants you decide to use. 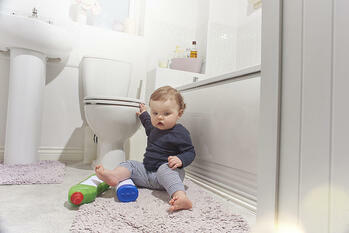 Even the most commonplace item in your home can become a danger to your child if not stored properly. For example, detergent pods make laundry time a breeze, but their bright, colorful packaging may attract little eyes leading to accidental ingestion. All drawers and cabinets in your home should be fitted with latches once that little one starts exploring. This will help thwart their plans of getting into something they shouldn’t and injuries from the doors & drawers themselves. Also, check the windows to make sure they can either securely lock or have guards in place. Screens will NOT prevent a child from falling out of a window. Any large pieces of furniture should be anchored to the wall, especially if you have a climber or live in an area susceptible to earthquakes. Sharp corners, such as coffee tables, end tables, and counters should be covered to prevent injury. Bathroom doors should have locks that can be unlocked from the outside to prevent accidental lock-ins. Stairs should have baby gates that are installed properly and not just leaning against the banister. According to the CDC, from 2005 – 2014, there was an average of 3,536 fatal unintentional drowning deaths in the U.S. annually. Children ages 1 – 4 have the highest likelihood of an accidental drowning. It’s a good idea to start your little ones in swimming lessons as soon as possible. The better equipped they are with basic skills; the less likely they are to drown. While in the pool, they should always wear a floating device. If you have a pool at your home, make sure there is no way your child can get into it. This can either mean building a fence around the pool or making sure the doors to the outside are locked at all times.